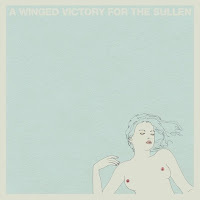 An up and coming ambient/classical act, A Winged Victory for the Sullen has quite the charming and intriguing pedigree. The duo is made up of Adam Wiltzie (Stars of the Lid) and Dustin O'Halloran (Devics), two of the genre's heavy hitters. Stars of the Lid alone should perk up some ears, as that duo defined 2000's ambient scene with their two groundbreaking releases. A Winged Victory for the Sullen has big shoes to fill, with the aforementioned pedigree being both a gift and a hindrance. Too many people will check out the band's self-titled debut with an unfortunate amount of per-connotations. But this isn't Stars of the Lid nor is it Devics. This is something else, but at the same time it is a logical amalgamation of either artist's sounds and abilities. It's piano driven, courtesy of O'Halloran, and very straightforward in its ambiance, thanks to Wiltzie. It's a beautifully composed meshing of minimalism and contemporary classical, offering a healthy dose of ridiculously pretty chords and lush swells and timbre. A Victory for the Sullen sort of falls flat in its incredible simplicity. Where Stars of the Lid creates deceptively simple ambiance, A Winged Victory for the Sullen makes very basic, very straight to the point music. It's beautiful, yes, but it isn't exactly challenging. There aren't any surprising transitions or unexpected movements. It's just preposterously gorgeous ambiance. Regardless of its inane simplicity, A Winged Victory for the Sullen is still an amazingly engaging and wondrous listen, easily topping every ambient album this year. The strings and piano add a layer of drama not typically seen in albums such as this, and it's an excellent injection of creativity into a tired formula. For those looking to simply get lost in a subtle and emotive world of swelling melodies and minimal orchestration, A Winged Victory for the Sullen is definitely worth looking into.